My daughter is home for the winter break. I took the last week and a half off from work and made plans to bake a lot of classic recipes from my bookmarked list. Things didn't go the way I had planned. First my daughter wanted to bake/cook some tried and tested dishes she had been craving. Then I pulled a muscle in my back and had to take it easy. At the end of the day I am glad I got to spend time with her and plan to make the most of the next few days before she heads back to school. I baked this Focaccia as the last baked recipe of the year. The idea for this recipe started with some Brie I had left over from a party. I wanted to use it up and started brainstorming ideas. A few years back I made sandwiches with the classic combination of apple, caramelized onions and Brie. We loved the flavors. We always have apples in the fruit basket so this seemed the perfect way to use the cheese. But then I thought I should try something different. A few years back I had made these mini Brie en Croute. I figured I could add the apple and onions in place of the fruit preserve. I had some dough made with my sourdough starter intended for dinner rolls or pav for Vada pav that my daughter was craving. I was planning to use some of the dough for this recipe. The percentages of ingredients in that would were better suited for a Focaccia than the Brie en croute and so in the end I went with this Focaccia. Everyone enjoyed the flavors of apple, caramelized onion and Brie with the sourdough base. Combine all the ingredients for the dough in a bowl, cover and let it rest. After 15 minutes fold the dough over itself in the bowl. Turn the bowl a quarter turn and repeat. Repeat the stretch and fold 8 times. Let the dough rest for 15 minutes. Repeat the process 3 more times. Cover the dough and place it in the refrigerator for 5-6 hours. When you are ready to bake prepare the herb oil by whisking all the ingredients in a bowl. Keep aside until needed. Next caramelize the onions. Slice the onion into thin slices. Cook the onion on low heat until it sweats and starts turning color. When it is a deep brown, turn off the heat and let it cool. It should be sweet. 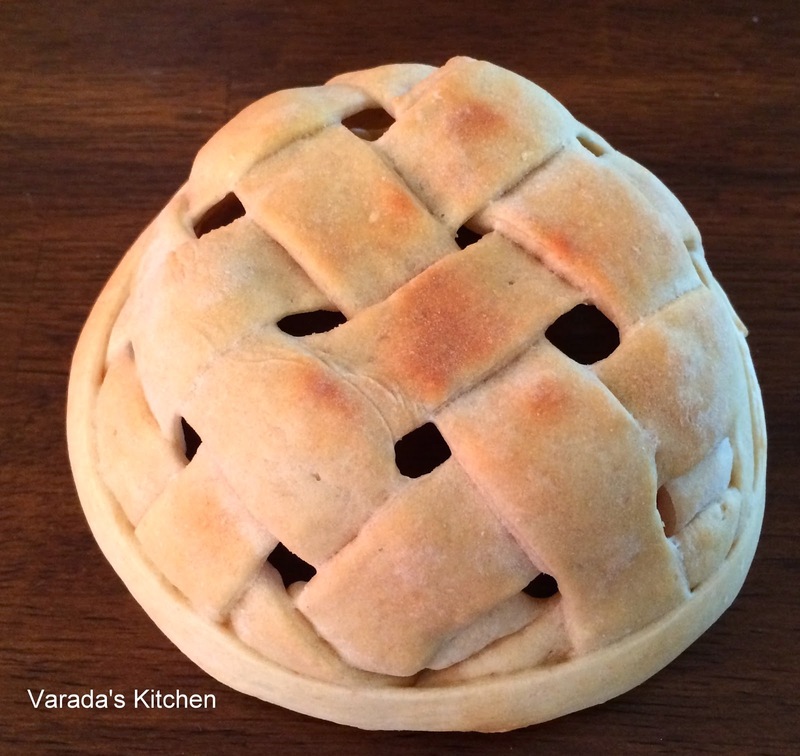 Preheat oven to 400 F. Take the dough out of the refrigerator and roll it into an oval shape. Cover and let it rest on the counter top for 15-20 minutes. Uncover and brush with the oil. Using your fingertips make dimples all over the dough. Bake uncovered for about 15 minutes. Prep the rest of the ingredients. Remove the partially baked bread from the oven and add the Brie, gouda if using and the apple slices. Return the bread to the oven for about 8 minutes. Sprinkle the onions over the top and bake for 5 minutes more. My daughter is home from school for winter break and all she wants are my tried and tested recipes. Between cooking those and work there is no time to try anything new. I am posting a recipe today that I made a while back. It was in my drafts and we like it a lot. I have a list of things to try while she is home. Hopefully I will get to it soon. These muffins are made with whole wheat and have no added sugar. The apples and the raisins provide the sweet flavor. If you like muffins really sweet then you could add some sugar. Preheat oven to 375 F. Grease muffin molds with olive oil on a muffin pan. In a bowl mix the flour, cinnamon and baking soda. Whisk the eggs with the oil and vanilla extract in a separate bowl and add it to the dry ingredients. Mix them together. Peel and dice the apple. Add the diced apple, raisins and coconut to the flour mixture. Mix it well but do not knead. The resultant batter is very thick. Scoop the batter into the greased muffin molds. You should get 12 muffins. Bake for about 20 minutes. Place on a cooling rack to cool completely before storing. I few years back I baked two woven bread baskets. I have since found this edible spring basket referenced in a few easter articles. Both of my earlier versions of baskets used ropes and the weave was tight. I was very happy with those baskets but I wanted to try something different. I wanted a make a basket with open holes that looked like it was part of the weave. This is what I came up with. This basket was not made with ropes. Instead I made the lattice using flat strips of dough. I used a different technique with the weave. Instead of weaving it on the mold I wove it on a flat surface and then transferred it to the mold. This caused the holes to form in between the strips something I was looking for. In the end I was very happy with the result. This basket is a lot easier to make than the two I made before. It is much smaller and uses a small amount of dough. The weaving technique is simpler too. I used my sourdough starter for this recipe but you could use commercial yeast if you wanted to. If you use commercial yeast refer to this basic dough recipe to prepare your dough. Roll out a large rectangle from the dough. Using a small custard or similar bowl to ensure you have coverage cut a portion of the rectangle as the base (portion on left below). Cut this rectangle into wide strips being careful not to cut all the way through. Cut the remaining dough into wide strips cutting all the way through. These strips are to be used for weaving. Preheat the oven to 375 F. On the base fold back alternating strips. Place a strip horizontally such that it covers end to end. Unfold the folded strips. Now fold back the other set of alternating strips and place a weaving strip horizontally. Continue working the weave until you get to the end. Cover the outside of the bowl with foil. 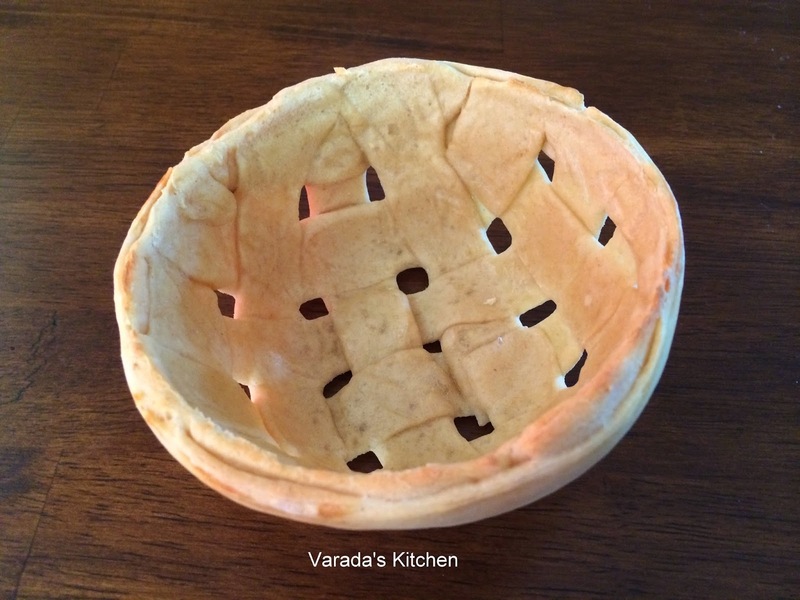 Place the woven lattice over the bowl taking care to see it does not unravel. Cut off the access. Trim the edges to get a smooth edge around the edge of the bowl. Using the discarded dough roll out a strip long enough to circle the edge of the bowl with a little overlap. Trim the strip to get neat edges and place it around the bowl. Seal the ends together by pressing the overlapping ends over one another. Place the bowl on a baking sheet and bake for 10-15 minutes. The bowl should begin to brown slightly. Allow it to cool on a rack for a few minutes. Unfold the foil over the bowl and remove the bowl carefully. Now carefully peel off the foil from the bread. My post today is another version of crackers. I have few versions on this space already. Crackers are make a perfect snack with a cup of tea or coffee. After baking crackers with wheat flour I decided to try others flour combinations. Two days back I baked semolina crackers. Next I tried crackers with besan or chickpea flour. These were harder to perfect. I first tried with uncooked flour and realized the flour does not cook completely in the oven. The next time I used oil to roast the flour but that did not work either. Finally I tried ghee and it worked out. The crackers are crunchy and delicious. Everyone at home loved the flavor but I think they have had too many versions of my baked crackers. I think I will have to finish these myself. Need to give these cracker experiments a break for a while. But now I have four perfect cracker recipes. Heat the ghee in a pan. Add chickpea flour and on low heat roast the flour until cooked. You could do the same in a microwave checking and mixing the mixture every 30 seconds until the flour is cooked. Let it cool. Combine with all the remaining ingredients. Place it in a bowl, cover and put it in the refrigerator for an hour. Preheat the oven to 350 F. Remove the dough from the refrigerator and roll it on a parchment paper to about an eighth of an inch. Using a knife or roller cut into 1x1 inch pieces. Pierce with a fork. Bake in the preheated oven for about 15-20 minutes. Check often as these burn quickly. When done transfer to a cooling rack and cool completely. I usually take a small afternoon snack with me to work. Whole wheat crackers are my favorite. About 10 1x1 inch crackers usually suffice. I would bake the crackers over the weekend. They would make a filling snack. After a few weeks I began to crave variety. So last month I began experimenting with different flours. Some experiments were failures and some were successful. One Saturday my husband decided to make upama for an evening snack. When I saw the fine semolina I realized it was a good candidate for my experiment. Unfortunately the experiment failed. The flavor was really good but you could taste the gritty semolina as an after taste. I realized I had to roast the semolina before I made the dough. The next attempt was a roaring success. Place the semolina in a pan and roast it on low flame until it begins to change color. Turn off the heat and let it cool. Mix all the ingredients in a bowl to form a ball. Cover and refrigerate for an hour. Preheat the oven to 350 F. Take the ball of dough from the refrigerator and place it on a sheet of parchment paper. Roll it to an eighth of an inch. Using a pizza cutter, a knife or a decorative roller cut the dough into 1"x1" squares or diamonds. Pierce each cracker with a fork. Place the parchment in a baking sheet. Place the sheet in the preheated oven for 20-25 minutes. The crackers will be soft when taken out of the oven. The will harden and turn crispy as they cool. Perfect as a snack or with a cup of tea. Stuffed bread rolls are perfect for weekend brunch. Most of the prep work happens the night before. The day you want to bake these all you have to do is heat the oven and pop them in. This is the reason they are my favorite when my daughter is visiting. I can prep everything ahead of time and let the refrigerator and then the oven do all the work. I like to make something new and different when my daughter visits from college. I have made stuffed rolls before but changing the stuffing makes for a completely new recipe. This time I used tomatillo and red bell pepper chutney mixed in with some cauliflower. You can take any chutney/sauce you have on hand, mix it with minced vegetables, saute until almost dry and use it as stuffing for these rolls. The sourdough rolls are my recipe made with whole wheat flour. The end result is wholesome, filling and flavorful. I got the recipe for the chutney from Harini's blog. The night before combine all the ingredients for the buns in a mixing bowl and form a soft dough. Cover and keep aside for 30 minutes. Uncover, reach down to the bottom of the far side, pick up the dough and fold it over the top towards you. Turn the bowl 90 degree and repeat. Continue until you have gone around twice. Cover and keep aside. Repeat this stretch and fold procedure two more times every half hour. Finally cover and keep aside for at least 4-5 hours. Alternately, keep refrigerated overnight. Before you are ready to stuff and shape the rolls prepare the stuffing. For the chutney chop the peppers. Peel and chop the tomatillos. Heat oil in pan. Add the mustard seeds, sesame seeds and channa dal. When the mustard seeds sizzle add the curry leaves and peanuts. When they change color add the chopped vegetables. Saute until cooked. Turn off the heat and let it cool. Run it through a blender to desired consistency and keep aside. Heat a 1/4 cup of water in a pan. Finely chop the cauliflower, you could mince it if you like. Add it to the heated water and let it cook on medium/high heat until done but not mushy. Lower the heat a little to medium/low. Add the chutney and adjust seasoning. Remember the bread does not add much flavor so the stuffing has to compensate for that. Saute until it is dry with very little moisture. Cool. Take the dough out on to a lightly floured work surface. Divide the dough into equal parts of about 70-80 gm each. Begin working each piece of dough into a bread roll like in my original sourdough buns recipe. When you have a smooth surface flatten the dough and stuff it with the stuffing. Bring all the sides together and continue shaping. Place each roll in a baking sheet. Cover and place the sheet in the refrigerator and let it rise overnight. When you are ready to bake preheat the oven to 375 F. Place the baking sheet, uncovered, in the oven and bake for 30-33 minutes.